One of the parameters of the Station’s orbit around the Earth is the beta angle, which determines the direction from which the Sun’s rays will hit us. We don’t usually bother too much about this parameter because it doesn’t affect our day-to-day life, except in certain situations: when the beta angle is very elevated, as it has been these past few days, we spend long periods in sunlight. Daytime becomes relatively long, while the nights are very short. This makes it difficult for us to look out of the Station and see our planet at night, because the Earth is in shadow while we are still in the light. As a consequence, it is pitch black outside. It’s like looking out of the window at night when you have the lights on in the room and there’s not one streetlight lit outside. Lately, after making the final evening report to Houston and the other Control Centres, I’ve got myself all prepared to take a few photos but found that nothing was visible in the sky. We’ve been travelling immersed in completely black space. That’s when I thought about using one of the pieces of equipment in the European laboratory Columbus, an instrument that is sometimes a little neglected by us astronauts: the amateur radio set. Now, I must confess to all amateur radio enthusiasts out there that I have never been into amateur radio. As a military pilot, I was trained to use the radio professionally, following the mantra of the 4Cs – Clear, Correct, Concise Comms [Communications], which was repeated at the start of every mission. It was radio contact seen as a means, never an end unto itself. In fact, sometimes when we flew very complex missions, the interference caused by blissfully unaware radio enthusiasts ‘exploring’ our frequencies inevitably led to a great deal of bad tempered frustration! I set the radio to the ‘random’ contacts frequency, and without knowing what to expect, I put on the headphones. Physically, the International Space Station was still many kilometres away from the coastlines of Europe, but our horizon stretches out beneath us for thousands of kilometres and the various European ground stations could already see us. My ears were immediately overwhelmed by a cacophony of unidentifiable sounds and noises, voices, screeching and white noise. Then suddenly, a voice surfaced above the other sounds; it was a young man, in my mind barely more than a boy. He was calling the ISS American radio call sign (NA1SS) and repeating his own call sign. I was taken aback by the emotion that rose in me as I tried to reply to the call, using the Italian call sign (IR0ISS). But my excitement was nothing compared to the sheer astonishment and disbelief I heard in that voice, thousands of kilometres away. Speaking English with a beautiful Portuguese accent, the radio operator on the other side of the signal only managed to say a few words – “I don’t know what to say… This is a dream come true for me!” – before our conversation was interrupted and buried by swarms of other calls. For around 15 minutes as we passed over western, central and eastern Europe, I tried to reply to dozens of people who were sending their messages into the ether with the hope that, thousands of kilometres away, the Space Station antennae would pick up their signal and that I’d be able to decipher what they were saying. From different countries, through different radio sets, but all with the same desire, these people – up until moments ago complete strangers – started to take shape in my mind. They became members of one family, scattered over thousands of islands and in contact with each other through nothing but these ‘messages in a bottle’, sent out with no certainty at all but with the faint hope that somebody somewhere would pick them up. Messages sent out with stoical patience, without even knowing who in that infinitely vast ocean of ether would be able to listen to their call. Men, women, young and old, experts and complete beginners – they have all wrapped me in a warm blanket of friendship and gratitude, oblivious to the fact that I’m the one who should be thanking them for opening up the doors to an experience that began with that young man in Portugal, and that crossing space and time, reaches the heart of each and every amateur radio operator even before it reaches their ears. Tks , and welcome to our radioamateur world, i was one of the luky that you pick in a pileup – you said ih9ymc i heard you , buonasera . Emozionante! Penso allo stupore del ragazzino al sentire la risposta al suo messaggio dallo spazio! Grazie Luca per questi contatti. “Mi sorprende l’emozione che provo mentre rispondo alla chiamata…” sei straordinario. Sì, siamo dei perfetti sconosciuti, ma vedi come basta poco per sentirsi parte della stessa “famiglia”? Per molti lo sei davvero… un membro, lontano, della famiglia. Nice story! Ham Radio operators -well at least many of them- around the world are very interested in space exploration. Organisations like AMSAT (US/US/NL etc) even put up their own satellites with transponders. any many HAM’s have AZ/EL antennae rigs to communicate with others using them (costing in access of US$2000 to put up). 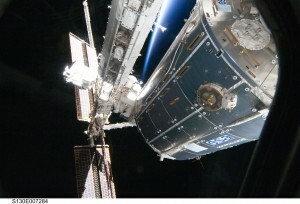 Since ISS has the equipment many are disappointed the station is not often used. I monitor ISS quite often and hear many calls to you station not being answered. Since ISS signals are very strong compared to cubesats, it works perfectly even without directional antennae and therefore it can be a first for many. Also expect many of them following what you are doing with the new SSDV equipment. Since you enjoyed it, please, please man the HAM station whenever you like. HAM’s often went true a great deal of trouble to get their licence and the ISS HAM station is one of the goodies which is good fun for astronauts in their spare time too! Vivere la tua esperienza col cuore e gli occhi di un poeta e non solo con la fredda lucidità di “semplice” astronauta, credo sia la massima espressione dell’amore di Dio verso il genere umano. Nei tuoi contatti hai trovato solo amici e, come tu dici, “una grande famiglia”. Se tutti si sentissero, almeno in parte, fratello dei fratelli, ciò che provi di lassù trionferebbe sulla terra. Grazie, ci stai facendo vivere attimi indimenticabili. That’s awesome Luca. I am totally enjoying reading this. I’m sure those voices that broke through all the squelch, and static will be talking about it for years to come. Great that you thought to go “Ham”.. Sorry to say , many people do not realize the important place Ham/Amature Radio has in Emergency, and Disaster situations.. Specially the use of the “Morse Code”. A good Ham Operator can Code faster than the majority of Text-ers. Plus all that is needed is a 12V supply of power to send information. nel buio non conta vedere un viso, ma sentire una voce che parla. E soprattutto sapere che qualcuno sta ascoltando, che le nostre parole non vanno perse nell’aria. Chi parla davanti a un microfono e cerca nella notte un altro ugualmente sveglio non ha bisogno di vedere, spesso non ne ha neanche voglia, sa che non è solo, e chi risponde fa un doppio regalo: a se stesso e all’altro, senza chiedere o ricevere niente in cambio. Generosità perfetta. Ciao Luca, non vedo l’ora di collegarti e di darti il benvenuto nella mia home! 🙂 73′ Iz3srf Antonio. Che emozione che avrai provato Antonio! Ciao Luca e bentornato tra noi “terrestri”. Volevo ringraziarti per il tempo che ultimamente stai dedicando a noi Radioamatori, sei sempre un importante punto di riferimento per noi rimasti quaggiù! Personalmente ti ringrazio per le tre volte che siamo riusciti a parlarci via Radio, non posso nasconderti la mia infinita emozione nel parlare con te! Grazie per gli infiniti spunti di riflessione che immancabilmente accendi con queste tue risposte in Radio e con le magnifiche immagini che ci invii da lassù! Ciao Luca, che dire ? Io mi aspettavo che tu parlassi dei tuoi affetti familiari, come avevi accennato in risposta ad una richiesta su facebook di Giuseppe Barbagallo, siciliano pure lui. Invece ti sei esteso e ci parli degli affetti e anche degli effetti di tutti coloro che ti seguono, qui nel caso specifico dei radioamatori. Io non sono un radioamatore e quindi non so che altro aggiungere, se non che non mi serve esserlo, in quanto su facebook siamo continuamente più che aggiornati e da te direttamente. Mi piace però notare qui il meccanismo, molto umano, di corrispondenza reciproca. Tu hai piacere di comunicare con noi, così come noi abbiamo piacere di comunicare con te. E questa comunione di intenti, sì ci fa sentire tutti dentro la stessa famiglia. Guarda che questo effetto è davvero bello e pieno di sfumature magiche. Insomma ci voleva lo Spazio per sentirci tutti un pò più vicini. Abituati alle moderne forme di comunicazioni digitali ed accessibili a tutti, è bello riscoprire anche quelle “pionieristiche” come la ricetrasmissione radio. Radioamatori, appassionati di radio, questa forma di comunicazione “casuale”, con la quale chi cerca un contatto non sa chi e da dove risponderà, proprio come ai tempo di Marconi. Grazie Luca per la splendida opportunità!!!! Hai scoperto e fatto conoscere al mondo di FB lo “spirito” della radio, la passione che lega milioni di radioamatori nel mondo che, alla ricerca di nuove frontiere, tentano ogni giorno nuovi collegamenti. Grazie all’apparato radio installato sulla ISS una nuova frontiera è stata aggiunta al’orizzonte dei radioamatori, grazie a te, e ai tuoi colleghi che ti hanno preceduto, qualche fortunato ha potuto condividere un’emozione mai provata che avvicina in modo inesplicabile i corrispondenti. Grazie per aver condiviso un’emozione che toglie le parole e lascia increduli. Grazie per aver riacceso l’interesse per i voli spaziali in molti giovani e aver riportato alla mente di molti l’emozione della corsa allo spazio. Grazie per le tue cronache e le immagini che ci invii quotidianamente e ci fanno sentire “amici” in pieno “hamspirit”. 73 de IT9GMR from Earth to Space. Spero che tu abbia intenzioni di scrivere le tue memorie un giorno con tanti di questi bellissimi quadri di parole che solo tu sai fare dal tuo punto di vista unico e irripetibile. Non succede spesso trovare questi talenti nella stessa persona–poetare e navigare lo spazio alla perfezione–quindi mi auguro che tu continui a fare tutt’e due all’infinito. Ciao Luca, non ho parole per dire quello che provo leggendo le tue parole, sei una persona molto sensibile, la prova e’ evidente , la commozione in me sale prima dal cuore e poi agli occhi. Non sono radioamatore ma mi piacerebbe molto…. Tutte le sere aspetto che tu sorvoli il nostro cielo puntuale, come se l’attesa riguardasse uno di famiglia, e quando appari a nord ovest mi dico ok tutto bene ciao Luca..
ma vedo con piacere che hai scoperto che c’e di piu . Mi permetto una nota tecnica: La ISS comunica con la terra grazie ad una rete di stazioni base sparse in tutto il mondo e poi collegate – via terra – con il mission control. Tutto questo avviene via radio. del buon vecchio Marconi !! sua Ericcson M-PA ( so che la kenwood e’ KO) e parla con noi radioamatori. Come si dice nel nostro gergo, 73 a te e a tutta la Crew, ci sentiamo via radio , magari. io faccio parte della tua stessa grande famiglia azzurra e posso solo che ringraziarti per le emozioni che ci fai provare dallo spazio. le radiocomunicazioni mi hanno sempre affascinato sono radioamatore dal 1990 e posso dirti che il contatto radio e molto piu umano di quello che si pensi, io dall’afghanistan in mix avevo un solo link con la mia patria ed era la radio, che mi faceva sentire i miei soliti amici da ogni latitudine dello stivale rendendomi le giornate molto piu lieti. sono orgoglioso della tua partecipazione alla missione spaziale spero di collegarti presto! Ciao Luca, forse il nostro modo di comunicare via radio e sfruttando le Onde Elettromagnetiche può sembrare anacronostico e banale in una società dominata dalla “velocità” di internet ma, come hai potuto constatare, ha un fascino tutto suo, è come fare un viaggio in treno in cui si apprezzano i particolari del paesaggio e si possono conoscere nuove persone e in cui il tempo diventa compagno dei tuoi pensieri. …ma davvero posso comunicare con te? “Uomo delle Stelle”?! Non posso credere che tu abbia il tempo di rispondere a tutti i messaggi, penso nemmeno a leggerli tutti. Voglio comunque comunicare solo il mio stato d’animo nel vederti nelle molteplici foto, che è di ammirazione, un po’ di invidia, stupore ed anche orgoglio patriottico perché no. Sì sei comunque il nostro “eroe” perché fai un lavoro “stupefacente”, che ancora oggi detto tra noi comuni mortali è fantascienza, ma anche per la semplicità che traspare dalle tue parole quando descrivi foto e situazioni. Perhaps the person you’ve described in the text could have been me, by coincidence or not. Maybe I was the one of the first people that made a radio contact with you from Portugal? we call and waiting for an answer from you out of the space station. Your experience is as exciting as ours, because we all dream one day being an astronaut. Via amateur radio are you with us in this space adventure. Mi auguro che, al Tuo rientro, Tu possa scrivere un bellissimo ed emozionante libro come i grandi viaggiatori di un tempo. Ieri sera prima di andare a dormire, ho guardato sul mio iPad le effemeridi della ISS e, al buio, mi sono messo in finestra per vedervi per l’ennesima volta passare. Mentre osservavo questo puntino luminoso pensavo: chissà se il comandante lassù sarà in ascolto sui 144? …. ma guarda un po … va a finire che salgo nella cameretta al piano di sopra e rispolvero quello che era la mia stazione di radioamatore. Una passionaccia che il passare del tempo (e magari anche altri interessi) ha affievolito ma , leggendo lo scritto di Luca , mi ha ricordato quelle stesse emozioni provate molti anni fà. I primi contatti radio quando una persona da un’altra parte del mondo rispondeva ad una tua chiamata e, per un attimo quasi incredulo pensavi : ” ma avrà davvero risposto a me ? ?” , breve pausa , si preme il pulsante di trasmissione per riprendere a parlare con lo “sconosciuto” farfugliando qualche parola di saluto (improvvisata e in un inglese misto spagnolo alquanto poco compresibile e grammaticamente corretta) , e quando gli si ‘ripassa’ il microfono e lui risponde di nuovo pensi: “allora diceva proprio a me !!!…”. Ciao Luca, da radioamatore posso solo essere entusiasta del tuo “primo” approccio con questo mondo. Sei riuscito con queste tue righe a trasmettere quel senso di emozione che l’attività radioamatoriale regala già “a terra”… l’idea che le grandi distanze possano annullarsi grazie alla radio! Ho provato a contattarti anche io in uno dei passaggi della ISS sul nord Italia… sentivo il downlink della stazione con una comunicazione in fonia in Russo. Quanto vorrei avere una radio che arrivi fin lassù per dirti infinitamente grazie. Luca che dire ogni giorno che passa ci sorprendi, ogni giorno qualcosa di nuovo, ogni giorno una nuova scoperta.Sei come un bimbo alla scoperta del mondo, ci prendi per mano e ci porti con te facendoci condividere tutte le tue emozioni, le tue scoperte, i tuoi sentimenti. Ed e’ vero sei parte di noi, fai parte della famiglia e ci fai sentire tutti una famiglia. Questo e’ straordinario, perché per alcuni minuti non pensiamo più ai ns singoli problemi ma ci uniamo tutti a te.E questo Luca e’ bellissimo.GRAZIE. Ciao, Grazie per le tue condivisioni, che siano foto o emozioni,e a farci partecipi dei tuoi sentimenti. Sei davvero una persona sensibile. Ti vogliamo tutti bene. Since first hearing Owen Garriott’s voice from space three decades ago, many Amateur Radio and space enthusiasts have tried to put ourselves in your seat, to imagine the thrill of space travel. I am one of those enthusiasts. Thank you for providing your prospective that mirrors our excitement hear on the ground. è emozionante per me, per noi che ti seguiamo su facebook, blog ed altro! la mia emozione più grande sta nel fatto che leggo, scrivo, parlo con un uomo, normalissimo come noi, ma straordinario per la realtà che sta vivendo, realtà che per noi è solo un sogno. Si, proprio un sogno che ha accompagnato e che accompagna la vita di molti. L’emozione che io provo, e penso tanti altri come me, è leggere l’emozione che prova l’autore delle tue ormai famose fotografie; potrei paragonarla all’emozione che prova un bambino nel vedere qualcosa di nuovo, di straordinario, ma in fondo normale; la stessa emozione e le stesse sensazioni che proverei io stessa. Carissimo Luca, ho letto con tanta emozione quanto hai scritto. Io ti ho collegato il giorno 7 agosto alle 21.20utc. Anche se non era la prima volta che collegavo astronauti dalla ISS, averti raggiunto è stata una emozione grandissima. Spero di collegarti ancora, magari se potrai riservarmi qualche secondi in più. So che sulla Terra, in Italia in particolare, tantissimi ti chiamano per collegarti. Io ho già avuto questo privilegio e spero di averlo almeno per una volta ancora. Buona permanenza ed un abbraccio! Ciao Luca, son sempre più sicura che sei un grande scrittore. Ma non è solo per ringrazianti di questo testo bellissimo che ti scrivo. È anche per dirti che da bambina sognavo di viaggiare nello spazio e di captare le voci di esseri che vivevano in altri mondi. Lo desideravo così tanto che avevo preso l’abitudine, ogni sera prima di dormire, di tapparmi le orecchie con le dita e ascoltare quel fruscio che inevitabilmente si sente cercando di interpretarne le variazioni come fossero suoni emessi da radio di altri pianiti, o di viaggiatori nello spazio. Credo che tu possa e debba soddisfare il tuo desiderio di usare la radio per comunicare. Entrare nel mondo dei radioamatori e’ piu’ facile di quel che non si pensi. Dove abiti, ci sara’ sicuramente una sezione dell’associazione dei radioamatori, prova a sentirli. Oppure guarda in alto, sui tetti delle case, e quan vedi delle antenne strane, stai certa che li’ potrebbe esserci un radioamatore. Se vuoi, scrivi alla mia mail, potro’ indicarti dei radioamatori vicino casa tua. ciao Luca è stato fortissimo parlare con te via radio, io da buon piemontese,emigrato in emilia ho pensato quanto ti manchino le prelibatezze della nostra cucina…..
buon lavoro e ci sentiamo presto !! Da radioamatore… mi sono commosso, complimenti Luca! Ti seguo, quando il lavoro me lo permette, su Twitter e ti ringrazio per tutto quanto condividi, foto, pensieri ed informazioni. Sono felice che la posizione della stazione ti abbia permesso di conoscere un nuovo utilizzo della radio. Io ho vissuto questa tua avventura dall’altro lato del collegamento, dalla Terra. Parmitano sei grande, ti osservo quando passi con la ISS tutte le sere. Un saluto dal Monte Amiata, Grosseto, Toscana. Una “stella”, una voce alla radio, una grande emozione. Grazie Luca! Grazie Luca, per questo tuo blog e per i post in cui ti fai testimone e partecipe dell’immensità del cosmo. 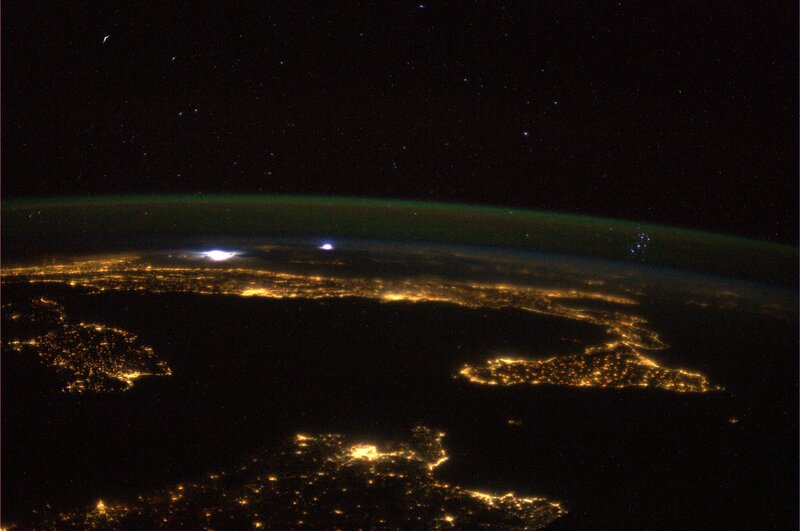 Credo che solo la Scienza sia capace di rendere orizzontale e democratica la contemplazione dell’umanità: visto da lassù nel nostro bello e fragile pianeta, siamo tutti uguali, e tu ce lo dimostri in ogni foto che scatti. deve essere proprio una esperienza straordinaria. Luca, you write so well! My excitement for communication contact between you and the amateur radio enthusiasts was building as I read. I love the “message in the bottle” metaphor! What an awesome experience for all. From your writing I can tell you have a big heart and a beautiful soul. You represent your country well. I am sure they have great pride in you. Speaking of messages in a bottle, I found one in Lake Michigan when I was a teen. It said, “The Off the Wall Gang, Chicago, Illinois” So I imagine it traveled from the Chicago shoreline to southwestern Michigan shoreline which is about 50 miles across. I was excited to find it because the idea of messages being sent in bottles had crossed my path just prior via tv or a book or my mom. Thank you for sharing your adventures. Godspeed. Grazie Luca.. le tue emozioni sono sicuramente condivise da molti amanti della radio. Per un attimo sognavo di essere al tuo posto …ci rappresenti molto bene non solo come Italiano ma anche come radioamatore… Le tue emozioni sono le nostre emozioni !! If you ever write I book, I’ll definitely read it! Ciao grande Luca, grazie per tutto ciò che riesci a trasmetterci attraverso questa tua meravigliosa esperienza…sembra quasi di guardare anche noi il mondo da lassù. Complimenti per le emozioni che hai provato, per come hai saputo raccontarle e per quelle che ci stai dando. Io ancora non ti ho collegato, ma ci provero’ senz’altro. Credo che essere lassu’, sapendo che qui sulla terra migliaia e migliaia di persone sono pronte ogni giorno e sperano di poterti collegare, ti spronera’ ad essere sempre in radio, quando potrai essere libero dagli impegni della missione e una volta tornato sulla terra diventerai radioamatore a tutti gli effetti. Da Radioamatore posso solo ringraziarti per quanto hai scritto!! Collegarti sarebbe favoloso non dispero di farlo!! E non parlo della ISS ma della comunità dei radioamatori. Grazie per condividere la sincera emozione provata nell’assaggiare la radio. Ti auguro di conservarne a lungo il sapore. ….tutta l’area camper Lido di Orrí con il naso all’insú per vedere il tuo passaggio. Sin da bambina ho amato la fantascienza . Sono cresciuta a pane e Star Trek , ed ora mi ritrovo a leggere te, e mi pare così strano…. Perchè ció che succede a te non è fantascienza, è reale ! Anzi no, è meglio della fantascienza . Perchè al centro dei tuoi racconti c’è sempre uno spicchio d’umanità , e tu riesci invariabilmente a dimostrare come scienza e tecnica possano essere usate per consentire alla propria anima di ammirare l’universo. E questa straordinaria tecnologia diventa solo un modo per far sì che tanti cuori, ognuno in un posto lontano, comunichino tra loro. Non so se tu ti rendi conto della rivoluzione copernicana che hai attuato : sei riuscito ad umanizzare la (fanta)scienza, a coglierne l’aspetto più nobile e straordinario. Hello to Luca and thankyou for the fast contact 11/8 1945 z It should be so fun to hear how it sounds at your end when hundreds of european station starts to call you. Thankyou fo being active on the VHF radio. I wasn’t sure until now if crew were on the FM transponders. Maybe I could try a contact or two. I have been reading about Astronaut Abby in the news, have you been able to make contact (voice) with her? Ciao super Luca, sono contenta che sei tornato a scriverci. Immagino la tua sorpresa e le tumultuose sensazioni provate nel confrontarti superando la contraddizione spazio-temporale con il concentrato di anime diverse sparse nell’etere. Tuttavia penso anche allo sbalordimento, alla tensione e al brivido vissuto da colui o colei a cui la tua voce è giunta, devi essergli sembrato E.T. che diceva: “Telefono casa”. Certamente una sensazione travolgente e straordinaria per entrambi gli interlocutori deve essere stata. E noi?! che non siamo radioamatori e non udiamo nulla?, ti assicuro che ci emozioniamo comunque con i tuoi scritti e con le tue foto attraverso le quali ci costringi a tenere gli occhi all’altezza dell’infinito. Un caro saluto. Luca, ci stupisci ogni giorno: sei super, sei eccezionale!!! It is with a great degree of excitement that I read that you are active on ham radio from the ISS. Although currently I am nothing more than a normal Earth-based citizen who’s a huge aviation and space passionate and who has also become an avid SWL, or radio listener, I cannot avoid feeling completely astonished on every ISS pass in which I have the opportunity to receive live, with something that can be as tiny and simple as my IC-R5 handheld scanner and its stock “rubber ducky” antenna, the voice of someone who’s right then out of the Earth (out of the Earth. This is quickly said!!! ), and through a direct link, with absolutely nothing in between the GP (Ground Plane)-type antenna used in the ISS and the one used by me. And though listening to the ISS voice downlink on 145.800 MHz during school contacts is great, nothing is comparable to hearing an astronaut calling CQ, because it means that if there is ham radio voice activity in the ISS, maybe when I obtain myself a ham radio license and callsign, my first ever QSO, or contact, could be with the Space Station, something that for me would be the thrill of a lifetime. 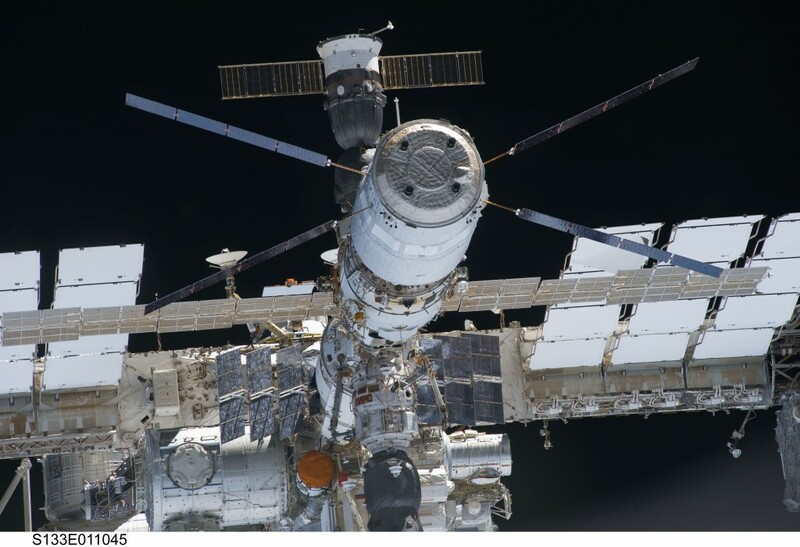 But radio activity in the ISS needs to be empowered, otherwise no ham radio operators will be able to have this incredible experience of speaking with an astronaut who’s out of the planet. It is been some years since Col. Doug Wheelock left the Station and I think it is been a lot of time without anyone in the ISS crews who remembered that random ham radio contacts can be a great way of directly involving the general public into the human spaceflight missions and programs (and dedicated so much time to random ham radio contacts as Wheelock did). Or at least I cannot avoid feeling part of the ISS program every time I set up the equipment and receive a radio signal from the ISS! In my opinion, ham radio is different from the rest of experiments carried out on the ISS, precisely because it enables normal citizens who are unlikely to become astronauts, to directly participate into human spaceflight, as I’ve stated above. This is why I think that the different space agencies involved into the ISS program should consider that more time was dedicated to it by the crews. They even might discover a new personal interest in it!!! All in all, keep up the good ham radio work from space! “Muchas gracias por tu interés en la radioafición desde la Estación Espacial Internacional”. David – an aerospace & radio communications passionate from Barcelona, Spain – now spending the holidays near the beautiful little town of Arén! Ciao Luca ,grazie per condividere cio’ che la RADIO e il mondo radioamatoriale “unisce” le persone , popoli di etnia diversa che casualmente si incontrano e condividono tutto ciò che appartiene ai popoli.Ero rimasto sorpreso sin dall’inizio dalle Tue attività per far conoscere a NOI “terrestre” le Tue sensazioni , GRAZIEEEEEE ,di cuore. I had been listening many times to your school contacts and to the random contacts as well. I tried to call in too, but not very persistantly. I can imagine how difficult the uplink situation is in your really exposed position. I hope you won’t get annoyed by that amount of interference pretty soon. I was wondering which way this situation could be improved and I have a suggestion. I know that you are sometimes using a backup uplink frequency for the school contacts in case the interferences on 145.200 MHz are too heavy. You might consider using different uplink frequencies in your random contacts as well. So in your CQ call just mention briefly where you will be listening (I would suggest somewhere between 145.200 and 145. 575 MHz). As soon as interferences get too strong again you announce a change of uplink frequency again. This is pretty much the way many rare amateur stations operate on the shortwaves. However I don’t know if your equipment allows quick and easy frequency changes. If not you really should get something better. Anyway I really enjoy listening to you and knowing that there is at least a potential link via the radio to you guys. I hope you will never need the amateur radio as an emergency backup. You are all doing an amazing job up there. IT´S POSSIBLE TO YOU CAN WRITE TO MY EMAIL. Attraverso le tue parole si riesce a vivere un’emozione fortissima, anche se credo non eguagliabile a quella unica, irripetibile, fantastica, stratosferica, spaziale…che hai provato tu passando sopra lo stivale e sulla Sicilia illuminati e splendenti. Anche per noi, rimasti giù, avere un sì sensibile poeta non è cosa da poco. Siamo fortunati a guardare attraverso i tuoi occhi ciò che non vedremo mai dal vivo! Will you try to convince your colleagues to use the ham station ? You help future generations to stay on touch with Space exploration. Caro Luca, leggere le tue riflessioni è sempre estremamente emozionante. Le tue parole sono sempre così coinvolgenti e ricche di passione… Grazie di cuore per la tua scelta di condividere tutto questo con noi! Luca, this was an inspiration to read..and indeed you are wraped in our warm embrace! Ciao “Luca ” lo scorso 11 Agosto alle ore (19:40 z ) ho avuto il piacere di collegarti ..!! ma non per questo meno Esaltante e Lusinghiero ..!! Grazie per l’oportunita’ , è spero che altri tanti ” OM ” possano avere il previlegio di poterti collegare .. Loved the story and obviously so exciting for ham radio enthusiasts! You are such an exceptional writer, Luca. Keep your blog posts coming! complimenti per la foto che hai pubblicato! 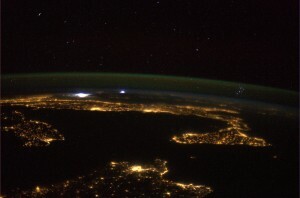 E’ la prima volta che vedo nella stessa foto (dallo spazio) il Mediterraneo ed il cielo stellato: ma soprattutto, attraverso l’atmosfera puoi vedere le Pleiadi! Sono un radioamatore di Villafranca Verona IK3JLV. Ho provato tante volte a chiamare mentre transitava sull’Italia. Spero di poter effettuare un collegamento anche rapido per uno scambio di saluti. Inoltre sono anche astrofilo e seguo con passione le varie missioni della ISS. Complimenti per le foto che ha pubblicato. Ci da modo di apprezzare sempre di piu’questo nostro meraviglioso pianeta. Grazie Luca di aver fatto capire cosa provano i radioamatori a contattare una stazione che non si sà se ti risponderà. It would be very interesting if you could record and post some of you amateur radio activity. Non ho parole per ringraziarti, ho appena letto la tua “visione” del 6 agosto (oltre a tutte le altre) e come sempre mi si è letteralmente allargato il cuore e tutto l’universo che ciascuno di noi si ritrova dentro senza saperlo. Leggendoti, a tratti mi sembra di sentire anche quello che non ha scritto. Grazie con tutta l’anima. Ti supplico di continuare a descrivere questo splendore, perchè ne abbiamo troppo bisogno. Sei in grado di farci stare “là”, perché non è un posto soltanto fisico…ma è un posto dell’anima e nessuno, nessuno, nessuno era mai riuscito prima d’ora a rendere così reale il senso dell’infinito, della bellezza che appartiene anche a ciò che apparentemente sembra “finito”. oramai tutti ti chiamiamo e scriviamo con tanta di quella semplicità e disinvoltura mai vista. Non è facile descrivere ciò che si vive nel quotidiano, quindi trovo sia semplicemente naturale il tuo farlo. Lo scrivi come se fosse la cosa più banale esistente; lo condividi con noi “umani” come se per te nascesse dal tuo cuore e tutto questo, per noi, sarà indimenticabile ed unico. Leggo di “amici” e “familiari” che riescono a comunicare con te, che lo fanno emozionandosi, che lo fanno, forse, senza nemmeno rendersi conto che stai scrivendo la Storia, con loro… che loro con te la scrivono. Ogni giorno milioni di italiani, americani, canadesi, asiatici… europei… si svegliano ed alzano la mattina per vedere cosa hai visto tu, cosa avete vissuto lassù, quale pagina abbiamo scritto e quale città sorvolato. Ogni giorno ci regali un sorriso… sorriso, si! …con questo post, ci hai ricordato che in fondo al buio… c’è sempre una luce!!! Sono un radioamatore del Gruppo dei Radioamatori dell’Aeronautica Militare Italiana, come radioamatore e come Gruppo, avrei piacere di ricevere un tuo saluto dallo spazio, la cosa farebbe molto piacere ai componenti del Gruppo, se hai piacere, puoi entrare nel nostro sito, dove tutti i nostrio colleghi, sia nin pensione che in servizio aderiscono per passione della radio e della nostra Arma Azzurra. Se decidi di lasciare un saluto, crfedo che molti se non tutti ne saranno felici. Ti augiriamo da colleghi, un buon volo ed una buona permanenza nello spazio, siamo tutti con te. What a great experience to watch visible pass of ISS with my radio in hand and listen your voice knowing that fastest moving dot over dark sky is place where you are. You have my respect of all your skills, knoweldge and great effort during your mission on ISS. Have a fun on amateur radio frequencies. Good luck! I will re-state what others have already said… our thrill in working all of you aboard is 100 times what you elegantly expressed in your post; I hope to work you myself one day. Safe journey to you and the rest of the crew. Just beautiful, Luca. It would be a dream come true for me as well to speak to you on the radio. I know Italy is proud to have you up there, I would be. Beautifull story Astro-Luca! Thank you for sharing your impressions from the Space-Station with us. And thank you for the short contact over Hamradio 🙂 I was so excited… my 4 years old godfather boy listened on the phone our radio-contact and watched the ISS flyby on his balcony in Zurich. Welcome to HAM Radio Luca! Ciao Luca, sono ik6ocx Camillo, il 23 agosto 2013 mi hai dato la possibilità di fare il più bel collegamento mai realizzato da quando sono radioamatore, spero di ricollegarti ancora e magari perché no di vederti via HAM TV ciao e buona fortuna. Ho visto l’aggiornamento della lista gel logbook onLine il mio nominativo priva della “X” finale IK6OCX DEVO ASSOLUTAMENTE RICONTATTARE, se si può magari aggiungere la lettera mancante nella lista ? come ti ho già scritto su twitter, tutti noi possessori ed utilizzatori di radio, aspettavamo questo momento. L’ansia inizia prima di ogni passaggio utile (che dura circa 10 minuti, ma di cui meno di 6-7 minuti sono utili), si è in attesa, un occhio al tracking sul pc, un’occhio per controllare che tutto nella radio sia al posto giusto, poi in un attimo è tutto passato. Quando so di qualche buon passaggio siamo davanti alla radio sperando di ascoltarti, mi tornano in mente quelle scene familiari di filmati in b/n del periodo pre-televisivo. grazie innanzitutto per aver raccontato questa storia e per il contributo che dai alla nostra attivita’ di radioamatori. Anni fa ho avuto il piacere di collegare il comandante Bill McArthur che si trovava a bordo della ISS e, anche a distanza di anni, lo considero ancora il piu’ bel collegamento radioamatoriale che abbia mai fatto. All’epoca ero residente in Sardegna, avevo il nominativo IS0FKQ e non avendo una stazione fissa a casa, ho provato per diversi giorni a collegare la stazione spaziale con una piccola antenna direttiva portatile e un ricetrasmettitore che tenevo in macchina, ad ogni passaggio montavo in fretta la stazioncina e provavo a farmi sentire. Spero di riuscire a rifare il collegamento, stavolta dalla piccola stazione che adesso ho a casa, per noi e’ sempre emozionante fare questi collegamenti con i nostri mezzi amatoriali. Credo sia difficile far capire a chi non e’ radioamatore cosa significhi, ma tu ci sei riuscito benissimo a descriverlo. racconto emozionante, sopratutto per chi come noi è appassionato di contatti a lunga distanza, sporadici, concreti e tecnicamente complessi. Lo spazio-tempo,con la radio, non esiste.400 km di distanza dalla terra sono un’inezia per il contatto (radio)umano. Grazie Luca per tutto ciò che stai facendo.